What is the motivation that brings fans to subscribe to a Sports OTT solution? Why do they decide to spend time and money with it? I spent some long days and nights reading social comments, scanning through customer service tickets, interviewing users, participating in focus groups, and more importantly, I have spent a lot of time being a real paying customer of deltatre’s and others solutions. I do have more than 16 subscriptions to OTT services to immerse myself in the matter. So what is a Maslow Pyramid? Most of you already know it, especially those with a marketing background, but just in case here it is. Maslow’s hierarchy of needs was developed by Abraham Maslow, a specialist in human behavioral psychology. It was first designed to help explain the connection between basic human needs and human desires. The hierarchy often visualized as a pyramid is split into five categories. Put simply, unless we have the fundamental basic human needs at the bottom of the pyramid we will not strive to meet any further desires. As each requirement is fulfilled we move up the hierarchy. 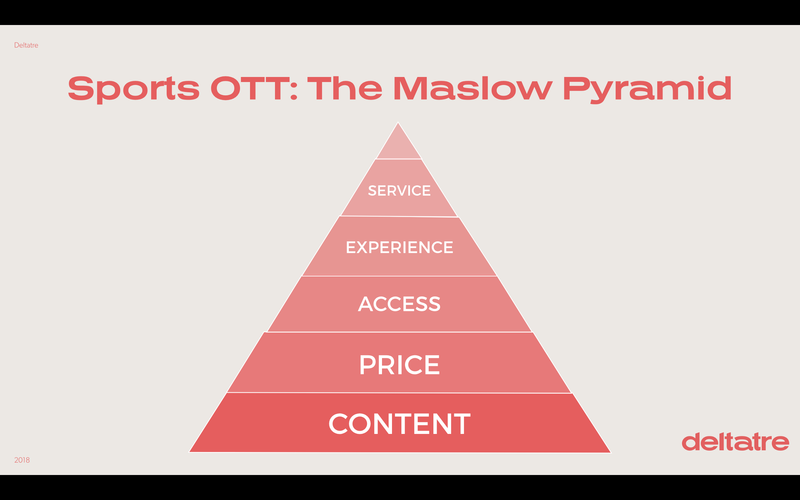 At the bottom of everything, the main reason for fans to subscribe and spend their time in a Sports OTT solution is Content. A specific Sport, a League, to follow their passion, something they can not find elsewhere in the same capacity. The Content they can’t live without. Before anything else, the amount that is asked for the content they love and want, need to be something they are willing to pay. As any pricing modeling, this has to be sustainable for the fan but also comparable to the competitive landscape in each market. Often, if different offers exist, they are not comparable (apples-to-apples), for example, the full league vs. only a partial offer with some top games, a vertical single-sport offer vs. a bundled offer. They want it, and they paid for it, now they want to watch it. There are two components to being able to access content. First, the OTT solution has to work 100%, especially when it matters the most, live. The basic need of making paying customers watch their top game, should be full-filled no matter what, even in its most simple form. Second, it has to be accessible on the device of choice with a particular emphasis on big screen devices. If fans own a Samsung TV or an Apple TV box, they will want to use it for their beloved sports. What is the end-to-end Customer experience? From the first touch point, customers are now expecting to be super-served, they will compare it with Netflix or similar products. We would love for this to be the no.1 priority because it’s where we spend most of our time, but we need to reckon it comes right after the previous ones. How are they treated when they need help? In cases where customers have questions pre or post sales and in those cases where things do not work as expected, fans need to be assisted and supported. Nothing should be between you and the game you want to watch, and if there is, you need a solution ASAP. Modern Customer Service (CS) platforms are a must, as it is the attitude of the CS agents. Understanding our paying customers needs is at the heart of creating a successful Sports OTT solution. Love to hear comments and feedbacks!